There was once a time when I obsessed about Art Basel and Miami Art Week. Where I'd go to Wynwood at 8am and wander the streets while artists from around the globe worked on their murals. I soaked in the street art like a tostada soaks in a cafe con leche. Now, those days seem like decades ago and the idea of getting anywhere with a baby before 10am on a weekend seems like pure lunacy. I recently trekked into Wynwood determined to see all of the new murals around the neighborhood. While wandering the streets with baby in tow, I stumbled upon a craft bazaar happening inside Concrete Beach Brewery's tap house. Who doesn't love locally made crafts? I suddenly felt perfectly ok with going to a brewery with a baby, yep I was that mom. We decided to take a break from walking around in the sun and got a couple of beers and some GH Cretors Pop Corn. I had heard about GH Cretors Popped Corn on the interwebs because their Chile Jalapeno White Cheddar and Dill Pickle flavors popcorn has gained some serious internet buzz. Unfortunately, they were out of those two flavors. However, I did snag their The Mix popcorn blend which consists of their buttery caramel and their aged cheddar cheese popcorn. So it has a sweet and salty flavor that goes perfectly with Concrete Beach's Le Tropical Vienna Style Lager. 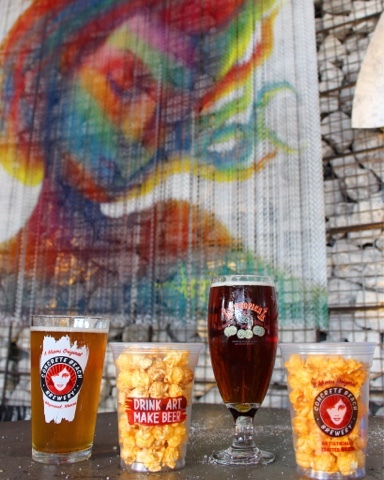 La Tropical Lager, The Mix, Just the Cheese popcorn and Rica IPA. As to not feel like a terrible parent for bringing my baby into a brewery, I did buy some locally made honey and a pair of handmade earrings at the ongoing crafts bazaar. Just picture it, a baby wearing lady with a beer in one hand, popcorn in the other and pointing with her nose at the different objects she wants to buy. Multi-tasking at its best. 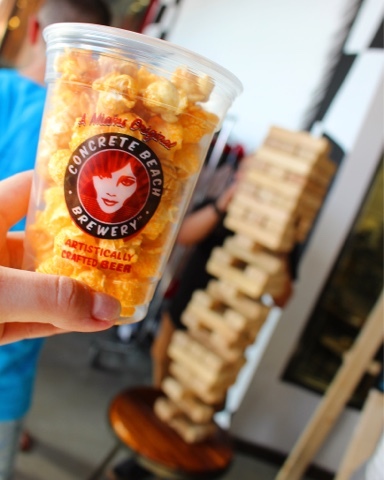 After my shopping, friends and I took up a game of giant Jenga while snacking on our popcorn and sipping on our beers. 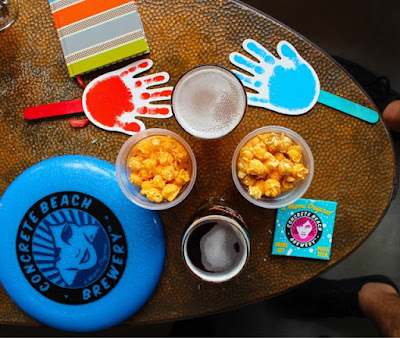 My friend had Concrete Beach's Rica Wheat IPA paired with GH Cretors Just The Cheese popcorn. I'm not a big IPA fan, but that cheesy popcorn was amazing. I couldn't help but feel super healthy eating this popcorn, lets ignore the part where I'm drinking a beer. Their popcorn is all natural, no GMO's, gluten free, no dyes and is even Kosher. 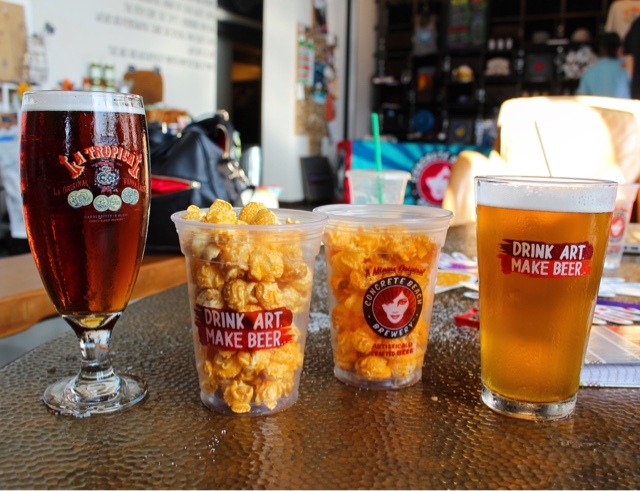 This popcorn makes for the perfect bar snack and makes you feel like you're still keeping your New Year's Resolution even though you've already had 4 beers. After hanging out at Concrete Beach, eating some great popcorn and caring for a baby that was on the verge of a meltdown it was time to go. As much fun as it was spending time with friends and doing something semi-normal after the baby was born, I was exhausted and my son was getting crankier by the minute. It was a great day and I discovered a new snack that I'm now obsessed with. I have to admit that I was hooked on this popcorn (no one tells you your food cravings get worse AFTER you have a baby) the minute we left the brewery and I needed more of this popcorn asap. I looked on GH Cretors' Store Locator and found that they're also available at Publix, Walgreens, Fresh Market and Whole Foods stores. I discovered they have even more flavors like Orchard Apple Caramel Corn, Organic Extra Virgin Olive Oil and Double Chocolate Caramel Corn. So if you're wondering, yes I drove down to the Fresh Market and bought 3 bags of this stuff. No, I didn't share. If you can, be sure to head to Concrete Beach Brewery for a beer and some popcorn while supplies last. 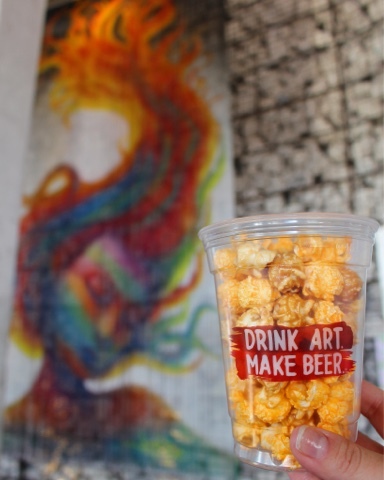 If driving into Wynwood isn't something you're interested in doing, be sure to check out their store locator to find GH Cretors Popped Corn near you. Check them out on Facebook, Twitter and Instagram for information on upcoming flavors and specials. This blogpost was developed in partnership with GH Cretors Popped Corn. All opinions expressed are my own.